Mosque elder Bao Jingui (L) joins other Chinese Muslims at the Nan Guan mosque for the Eid morning prayers during the sacrificial Eid al-Adha festival in Yinchuan, northern China's Ningxia province, Sept. 24, 2015. Authorities in the northwestern Chinese region of Ningxia look set to import "anti-terrorism" measures currently used in the mass incarceration of an estimated one million Muslim Uyghurs and other minorities in Xinjiang, official media reported. The Ningxia government signed an anti-terrorism cooperation agreement with Xinjiang "to learn from the latter's experiences in promoting social stability," the Global Times newspaper, sister publication to ruling Chinese Communist Party mouthpiece the People's Daily, reported on Nov. 27. It said local leader Zhang Yunsheng recently went to Xinjiang "to study and investigate how Xinjiang fights terrorism and legally manages religious affairs," it cited the Ningxia Daily as saying. "Zhang visited Xinjiang's stability maintenance and counter-terrorism center and local public security bureaus where new technologies like big data have been deployed in the fight against terrorism," the paper said. "Zhang ... noted that the progress Xinjiang achieved is worth learning," it said, adding that Ningxia's historic links to the ancient Silk Road trading route meant that the two regions have similarities. "That's why Ningxia went to learn from Xinjiang," Zhang said. 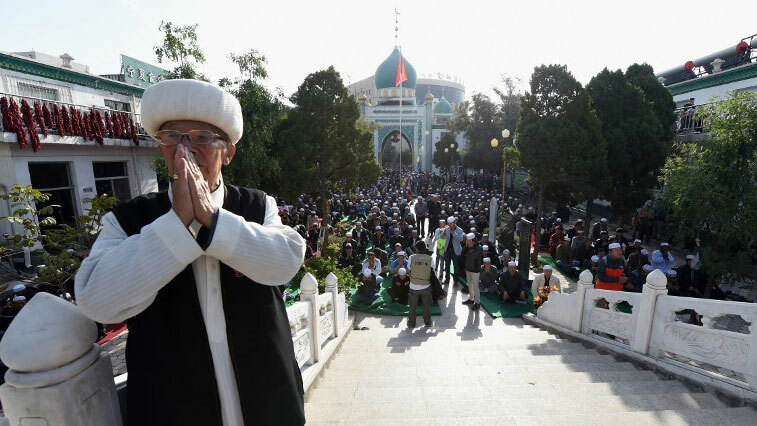 Dilxat Raxit, spokesman for exile group the World Uyghur Congress, said Beijing likely fears a backlash by the region's Hui Muslims in the wake of the demolition of a mosque. "The government forcibly demolished a local mosque, which caused unrest, which in turn has made Beijing terrified," Raxit said. "The hard-line religious purge policy being implemented in the Uyghur region [of Xinjiang] was also implemented in Ningxia." He said that while Ningxia's assimilation policy targeting Muslims had been more successful than similar policies in Xinjiang, Beijing still has its doubts about the region as a possible flashpoint for further violence. "Ningxia has been greatly influenced by China in terms of culture, but China has always had the aim of erasing their faith, otherwise [they think] it will always be a potential threat," Raxit said. A spokesman for the Islamic Association of Ningxia Hui Autonomous Region said on Monday that the government has not yet sent out any orders relating to greater restrictions on Muslims. "The mosque was previously demolished because of illegal construction," the spokesman said. "All the government did was to call for the situation to be rectified ... probably out of consideration for making management [of Muslims] easier." And member of the same association said in a separate interview that they hadn't heard anything about any new measures targeting Muslims in Ningxia. "We have never heard about this, and we don't know much about the actual content," the member said. "This is normal ... strict is good; the government may consider other policies in this area ... and we still have to implement them." An official who answered the phone at the Ningxia Hui Autonomous Region government declined to comment on the report, however. "You need to call the relevant department if you want to find out about this," the official said. "You need to call the propaganda department ... you can't call here." Adrian Zenz, a lecturer in social research methods at the Germany-based European School of Culture and Theology, has said that some 1.1 million people are or have been detained in the camps—equating to 10 to 11 percent of the adult Muslim population of the Xinjiang Uyghur Autonomous Region (XUAR). While Beijing initially denied the existence of re-education camps, the Uyghur chairman of Xinjiang’s provincial government, Shohrat Zakir, told China’s official Xinhua news agency last month that the facilities are an effective tool to protect the country from terrorism and provide "vocational training" for Uyghurs. Reporting by RFA’s Uyghur Service and other media organizations, however, has shown that those in the camps are detained against their will and without due process. Camp inmates are subjected to political indoctrination, routinely face rough treatment at the hands of their overseers, and endure poor diets and unhygienic conditions in the often overcrowded facilities. Last week, dozens of scholars from across the globe issued a joint statement expressing concern over China’s mass incarceration of Uyghurs and other Turkic minorities in the XUAR and called on the international community to take action against “the mass human rights abuses and deliberate attacks on indigenous cultures” in the region. The scholars called on China to shut down the re-education camp system, urged states and institutions to impose economic sanctions on Chinese authorities and technology companies that are benefiting from the system, and demanded that governments grant asylum to Uyghurs and other Turkic minorities at risk in the region and refuse to deport them to China.